Website and processes: 7 Jun 16 Mrs K.B., 5/5 Excellent "What an excellent and very successful Birthday present for my husband who enjoyed his Tiger Moth flight so much and was beaming from ear to ear. My only critisism was that when we arrived ahead of our time as instructed. David was given an earlier take off time so was rushed through his 'learning' pa..."
Taster Trial Lesson in a Microlight. Short flight briefing after which the student will be allowed to take the controls and actually fly the aircraft! This experience can be taken in either type - please specify on booking. 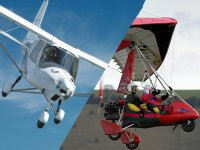 Microlight trial lessons are an increasingly popular way to enjoy light aviation. Our Taster Microlight Trial Lesson allows you to experience the thrill of flying and will even count as the first step towards your Private Pilot's Licence. The trial lesson is preceded by a short flight briefing with our instructor who will explain all aspects of the flight including the effects of controls and how a microlight flies. The flexwing microlight has a tandem seating arrangement - your instructor will generally ask you to sit in the P1 seat at the front - don't worry all instructors on these types prefer to sit in the rear seat anyway, it's the norm for them and s/he can oversee you all the time in the air. 3 axis microlight usually have two seats side by side. The student will then be allowed to take the controls and actually fly the aircraft! The weather plays an important part in all forms of flying, but Microlights are a little more susceptible to the elements than other forms, so please bear that in mind. Contrary to popular belief, the wintertime is the best time to fly in the UK, OK it's cold, but we can wrap up against that. The difference is the stability of the air, cold crisp winter days are the best, saying that though, last thing on a summers evening can be just as enjoyable. A truly fabulous gift for anyone of any age and also a perfect introduction to flying for those who have always wanted to try flying a microlight. Maximum weight is 15 stone (95 kg); maximum height is 6' 4" (1.93 m). Minimum age is 14 years (adult supervision required on airfield premises for under 16's). The voucher will have Wickenby printed on it, but it can be used from..